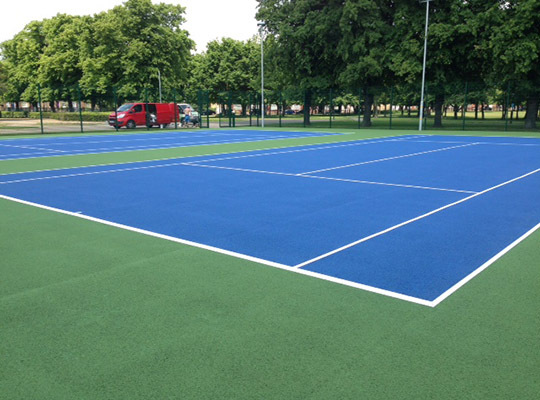 A cost effective porous macadam surface that is installed in a wide variety of locations, from homes, schools, colleges, sports clubs and on public courts. All our tennis courts and multi use games areas are constructed with a stone foundation and a base course layer of macadam. This improves a court’s overall stability and durability and the end result is a smooth, even, well-rolled surface that provides consistent playing characteristics and low bounce. The surface will then have two coats of ColourCourt acrylic paint, consisting of one undercoat and one top coat in Tennis Court Grade HG4 paint. Great care is taken with all mixing ratios and controlled carefully as any variation can affect the finished quality of the coatings. Optimum use of pigments can result in deep, intense colours.